If you follow my blog at all, you know that I have spend my life as both a seamstress and a quilter helping others. I do my best to donate up to 25 quilts a year to charitable organizations and have been featured on Michele Foster's Quilting Gallery, Project Linus and many other extremely well known sites. As I give suggestions for creating gifts for others, I incorporate as many free links, patterns and tutorials as I have time to make, create, or find online to honor others and the work they do. At the end of this post you will find many, many fabulous free patterns, tutorials and helpful advice from others far more talented in their specific arenas that I am. My goal is to showcase them, link directly to them if at all possible, and always give credit where it is correctly deserved. The one I am sharing today is Quilts 4 Kids is a world-wide effort involving a wonderful cross stitchery group in Australia dedicated to creating and donating squares for children with long-term or life-threatening diseases. Squares are created by individual stitchers with a selected child in mind. 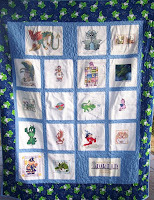 Themed squares are stitched on a sign-up basis and stitchers can choose their own patterns and requests. Once you choose a child that you would like to stitch for, you use a linking button on that child's website to link to a sign-up form. And while specific children/themes can be selected, any and all stitched squares are welcomed and use for non-specific 'emergency' donations. Being able to see a picture of that child and read about their medical conditions creates a wonderful heart opening experience for each and every stitcher involved and allows quilts to be custom designed for that child's interests. There is no charge for the quilt to the family and free patterns are given with specific directions for quilt blocks. This Stitch Dictionary of hand embroidery stitches enables directly links to the website of the original creator and designer of these fabulous tutorials. If all I did was share her link, you wouldn't visit her, this way you can see just how much as has compiled while I still honor and respect direct linkage to her! Please thank any and all of us who share our time consuming work with you as we do it out of great love for the art of stitching, sewing, and quilting. Thank you and many blessings to Sharon for sharing her amazing work with all of us!!!! Awesome list. I'll be checking some of these out later. What a wonderful thing to be making these squares for children. Wow Michelle, are you my US twin? LOL. I've also made quilts for Quilts 4 kids and Quilts of Love, from the donated cross stitch blocks. I You've been busy with your quilts too, blessing others and thanks for stopping by at my blog with your lovely words of encouragement.